This is an interesting article and the Vail Valley has seen some of the same bidding wars, particularly in the lower end of the market. Personally, I’ve made two offers recently for buyers and we were out bid by another buyer. There is a tremendous appetite for bank owned properties. Looking at Eagle County foreclosure sales, we should peak this year and start seeing fewer foreclosures next year. Much of it has to do with declining inventories. 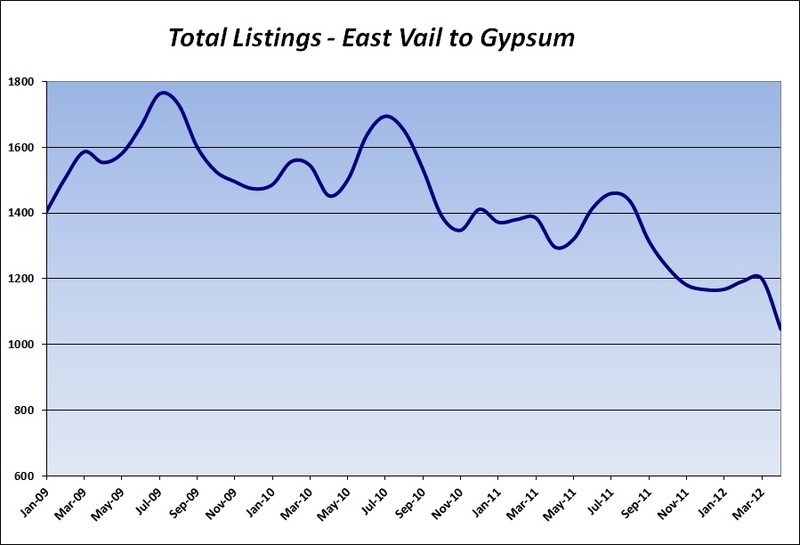 This graph shows what is happening in the Vail Valley with inventory. We are slowly but surely moving back to a more “normal” market although I don’t expect to hit the highs of the bubble before the recession. This entry was posted on May 4, 2012, 9:08 am and is filed under Vail Valley Real Estate. You can follow any responses to this entry through RSS 2.0. You can leave a response, or trackback from your own site.